On May 11, Jason Leon was riding late at night in a rural area of southeast Miami-Dade County when he and his passenger spotted the python. About 3 feet of the snake was sticking out of the roadside brush. Leon stopped his car, grabbed the snake behind its head and started dragging it out of the brush. When the snake began to wrap around his leg, he called for assistance from others and then used a knife to kill the snake. 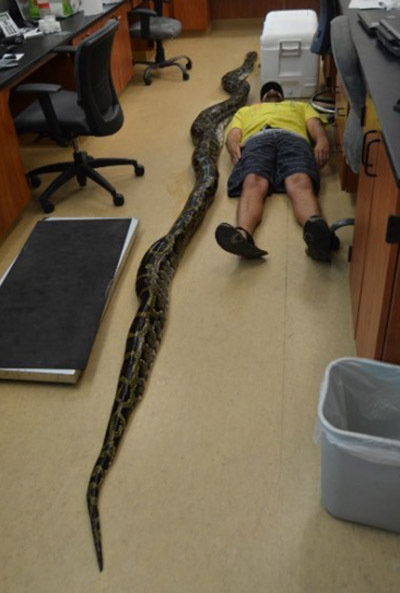 Leon once owned Burmese pythons as pets and has experience handling this nonvenomous constrictor species. Released and escaped exotic pets have become established in many areas of the country and adversely affect the native species. Efforts to reduce the numbers of exotics in the wild are underway, including a python round-up put on by the FWC in Everglades.